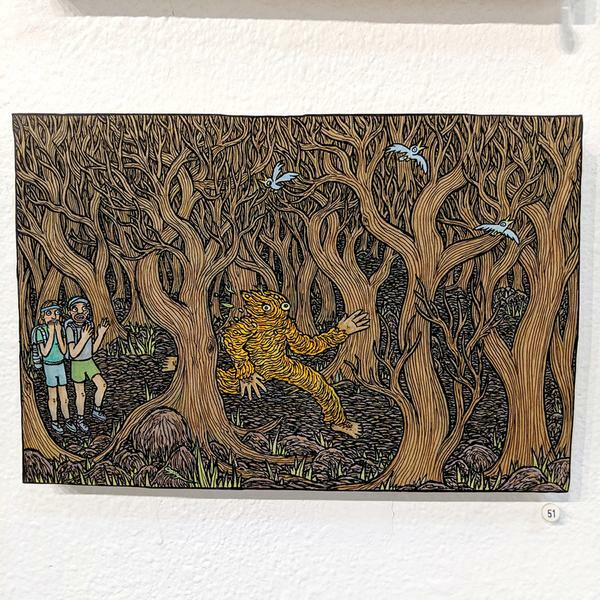 'Dancing Dreamtime Friend #51' by Theo Ellsworth. Last Saturday night housed an eclectic array of art and media at the Giant Robot Store 15th Anniversary. Most fertile was the continuing trend of childhood nostalgia (see recent reviews here and here) as a method of tranquilizing the fear of the unknown which resonates with the ostensible contemporary tumult. Like many works in this style, there is a warmth toward the confrontation of uncertainty – and from a children’s perspective, the entire world is a well of mystery. Indeed, it is because the world is so freshly novel that children have a sense of wanderlust. Yet simultaneous to this curiosity is trepidation; a lingering timorousness about what lies on the other side of the same unknown coin. Fruitfully, the artists in this unnamed movement are never despondently negative. They are veritably life-affirming, and this is indisputably seen with Theo Ellsworth’s works. By life-affirming, we connote an affirmation of overcoming the unknown – of staring into the Nietzschean abyss and greeting its cold black void with a friendly hello. For the childish grasp of the unknown is relatively bounded by a material human world, yet adulthood surreptitiously possesses the same blind turns; only that, adults have the will power to deny and suppress an appetite for tasting more of what can be seen, of what can be added color to the palette of a life. Perhaps the stultification of a life, then, is self-chosen once legal adulthood is granted with simply obligations? Mr. Ellsworth rekindles archetypical fantastical ergo irrational fears of childhood, yet approaches them from such a whimsically absurd perspective we can’t help but smile at the nostalgia. How simple the anxieties of life were when they were only phantasms! And not phantasms that are carnivores for child flesh, but mythical creatures that have been simply misunderstood. In Ghost Parade Witness, the ghouls and things that go bump in the night are shown to just be dancers to a beat of a different drum. There’s a clever capture of relieved astonishment, almost a gesture of that’s it?! On the boy witness’s face. Yes, once the fearful mystique has been devoured, that the world does possess an indestructible goodness a la Leibniz’s metaphysical claim, it is discovered that even its worst imagined possibilities can turn out positively unexpectedly. Ms. Godeleine de Rosamel takes to ceramic sculptures to present pseudo-anime amorphous figurines that are toothlessly disarmed. There is a friendly charm to them which is unique with respect to this achievement that does not require an invocation of cute furry animals. On the contrary, they are extremely austerely shaped, with neutral colors and a smooth polish and poker-faced expressions. Do they possess a heart? Can they know love? They seem to be a fantastical form of livestock, of work animals on some mystical far and away farm, whom move planks of wood around on their heads. Yet because of their servile disposition, we do show some adoration. Not necessarily out of pity, but out of gratitude for their service to the cause. These untitled figures abstractly demonstrate that even exotic fantastical figures possess a design and function which we can intuit, that they are under a natural ordainment, and that ultimately the semblance of function is a semblance of purposefulness, a good thing to be. And that is the secret ingredient to the providence of such a return to innocence. It is not retrospection to blind the present. It is archaeological excavation to build a better oriented future world. To befriend, rather than to dread, its coming.